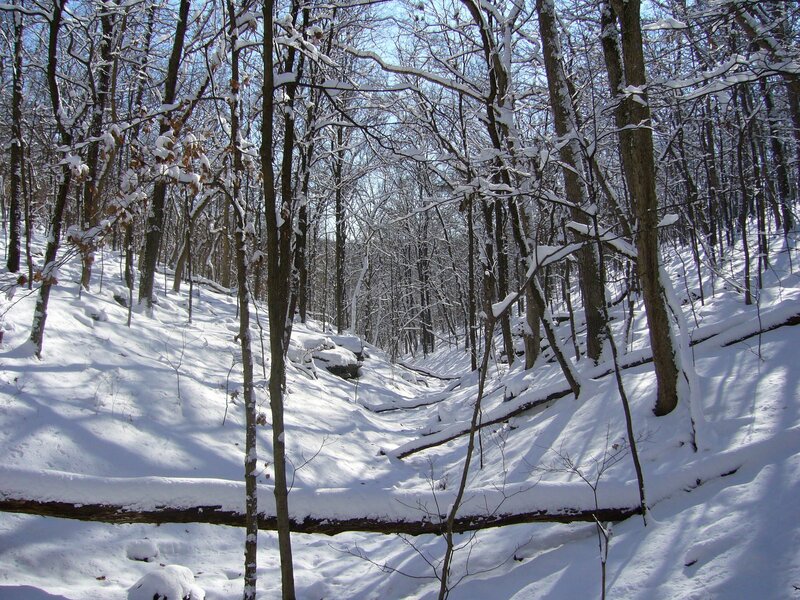 Rockwoods Reservation, in western St. Louis Co. is one of the oldest Conservation Areas in Missouri (est. 1938). It contains nearly 2,000 acres of high quality upland forest and a small prairie restoration plot. Despite its proximity to St. Louis and the numerous hiking trails it offers, I haven’t explored this area very much. 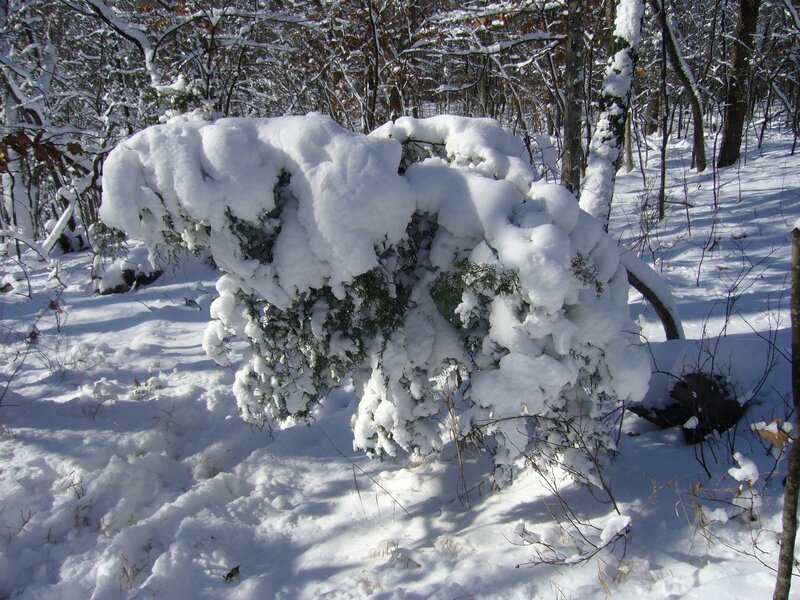 We had a winter storm move through the area yesterday, dumping about 7 inches of snow over the area. Deep snows are not common in St. Louis, which typically has more open winters, so today offered the perfect opportunity to start exploring this area in a rare wintery setting. 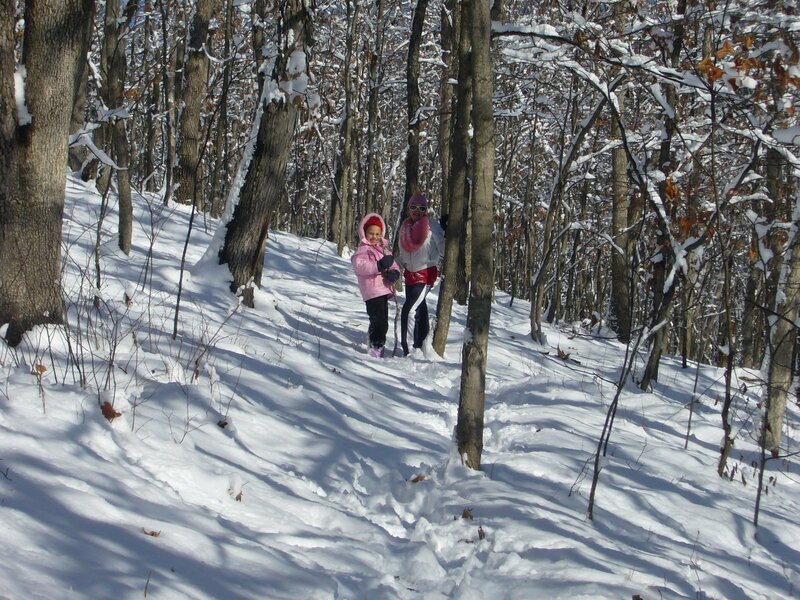 My daughters came with me to explore the 3.25-mile Lime Kiln Loop Trail. The first half mile of the trail follows alongside a spring-fed creek. As we enjoyed the serenity of the snowy landscape, a belted kingfisher flew into a nearby tree, where it paused briefly before zipping off in a chatter. 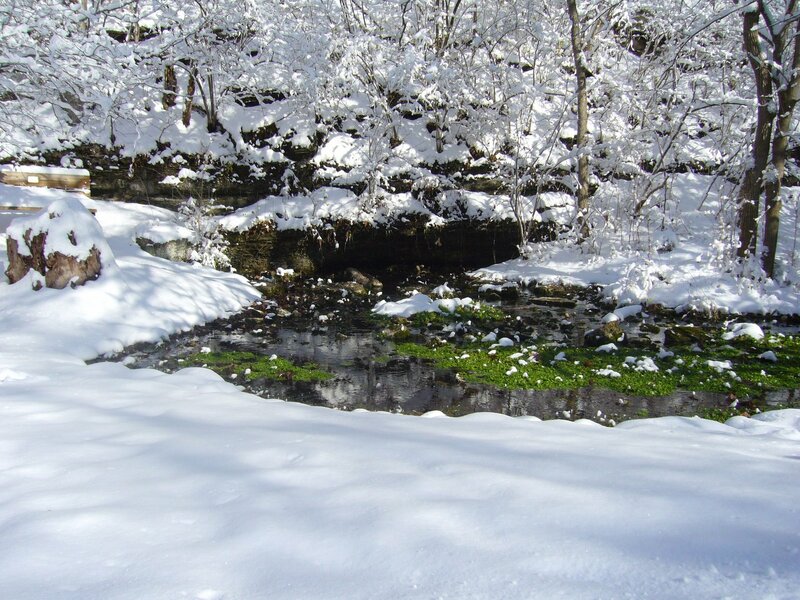 The spring itself offered a beautiful contrast between the green aquatic plants that populate the spring’s exit and the surrounding white blanket. 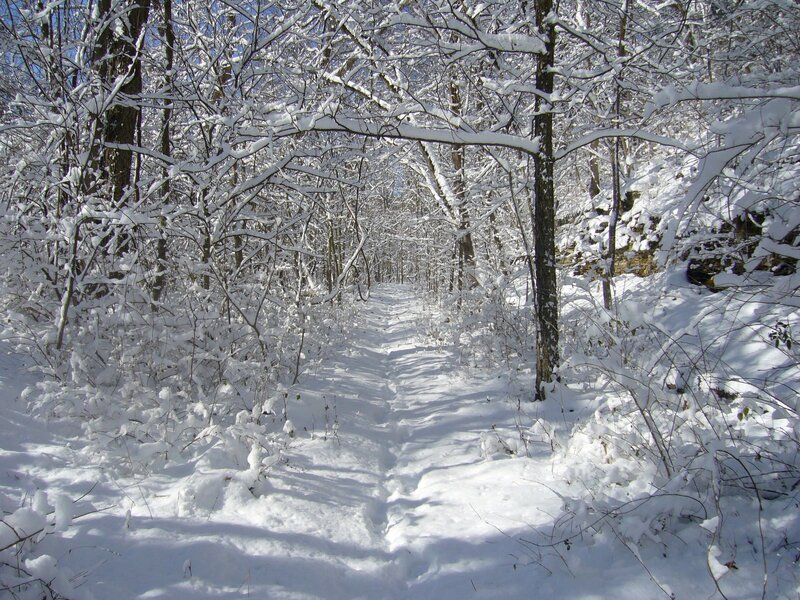 After the spring, the trail started traversing up the hillside into a mesic upland forest dominated by oaks and hickories. The high canopy of this mature forest resulted in a sparse understory, affording spectacular views back down through the draws from which we came. The girls were full of energy at this point, so they kept running ahead on the trail and then waiting for me to plod my way back up to them. Eventually they learned their lesson though – everytime they ran up ahead they would get hot and want to take their coats off, then they would get cold and have to put them back on. There were some drier forest types closer to the bluffs where eastern red cedar (Juniperus virginiana) became more abundant. I coaxed them to pass underneath this one, then whacked it with my hiking stick as they did so. Shocked indignation soon gave way to tenacious efforts on their part to ‘get me back’. Failing that, they redirected their efforts to ‘getting’ each other. The games eventually gave way to quiet enjoyment of the astounding beauty of the forest. Existing tracks in the snow told us we were not the first to enjoy the trail today, but we didn’t see a single soul all day – it was easy to pretend that we were the only people in this wood. 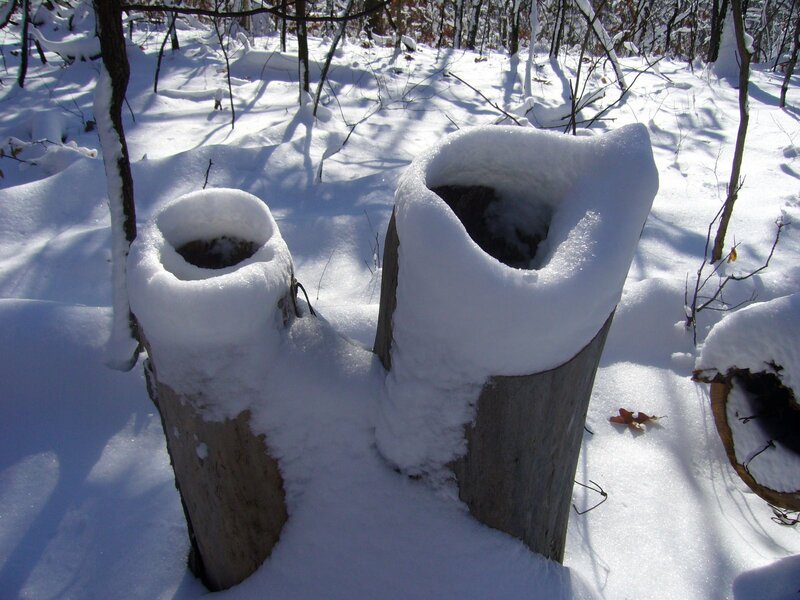 These snow-covered, hollow tree stumps reminded us of tubular sponges. As the trail descended back down into the valley it passed through these dolomite outcrops supporting a dry upland forest dominated by eastern red cedar and blackjack oak (Quercus marilandica). 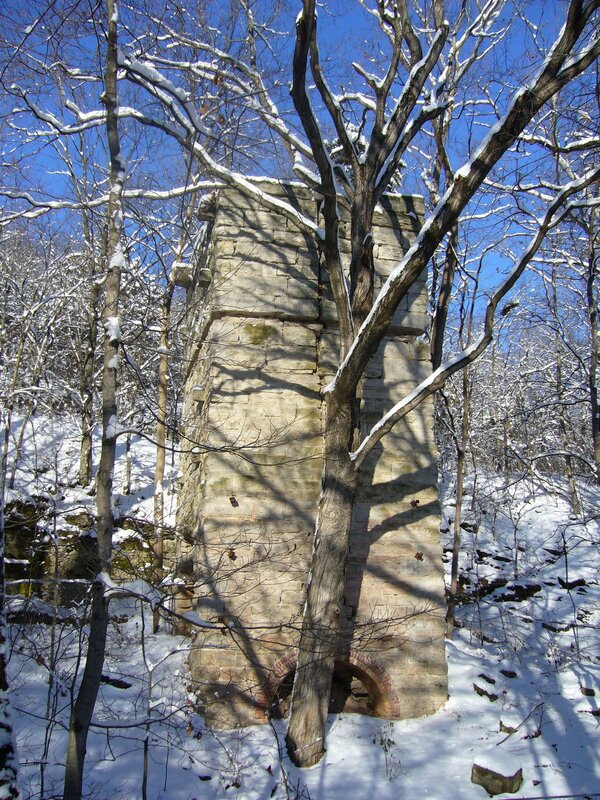 The lime kiln for which this trail is named was built in the mid-1800’s by a wealthy businessman, who used it to produce lime for mortar construction of homes in nearby St. Louis. The kiln, 12-ft wide at the base and 40-ft high, was built next to the hillside to allow limestone (quarried nearby) to be dumped in at the top. Locally cut firewood was loaded into the arches at the bottom on each side, which heated the kiln to 800°F, converting the stone to lime which was removed from the opening at the bottom in front. Vertical expansion joints on each side in the center allowed for expansion of the stone during heating. This was the second hike in the past few weeks that I’ve taken with the girls, and like last time they had an absolute ball! Of course, naturalist that I am, it pleases me that they enjoy the outdoors so much, and I’m quite impressed that they hiked such a distance with no complaint. 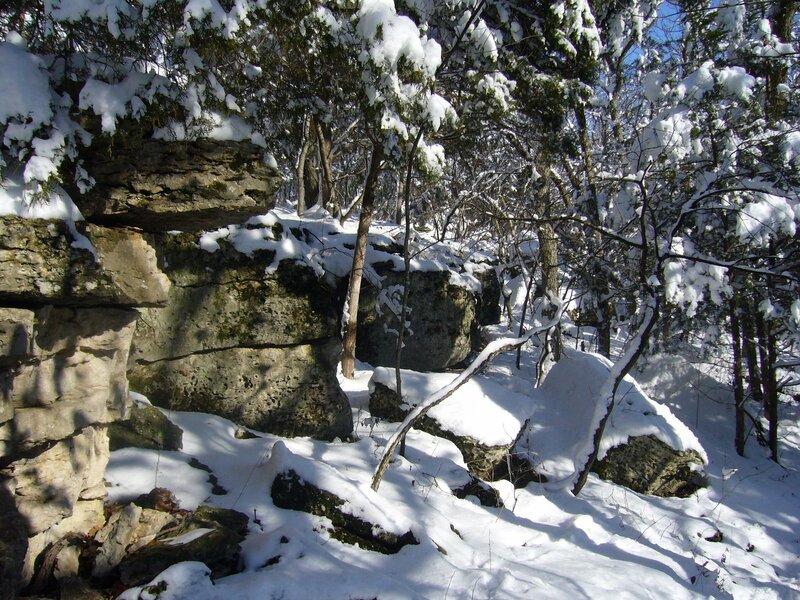 The area offers several additional hiking trails ranging from 1.5 to 2.2 miles in length. At only a 15-minute drive from our house, I look forward to exploring the rest of Rockwoods trails with them. 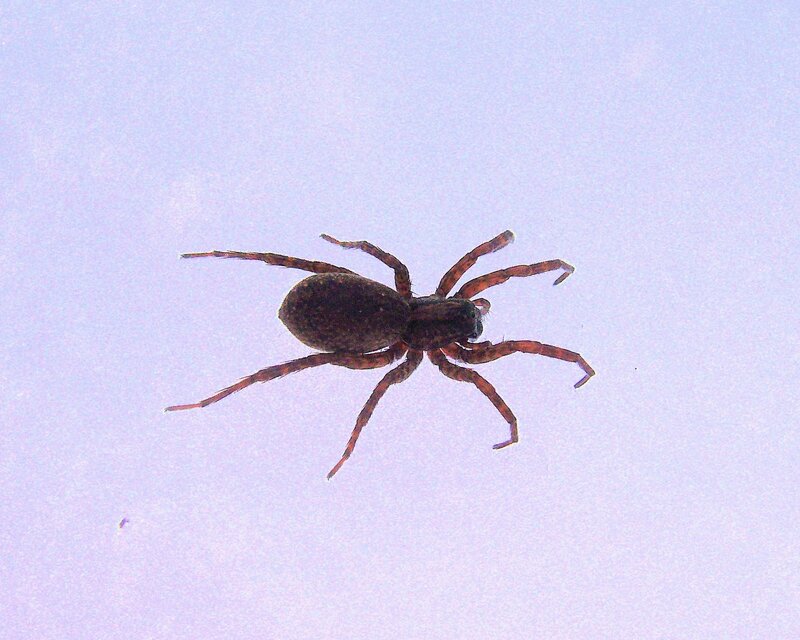 This entry was posted in Arachnida, Araneae, Cupressaceae, Diplopoda, Fagaceae and tagged arachnids, Botany, cultural history, entomology, family, forest, Hiking, landscapes, Missouri, nature, science, snow, spiders, trees. Bookmark the permalink. Hi Ted, I have a nice picture of a good size timber rattlesnake I saw there in the Spring of 2006. It’s a nice park.